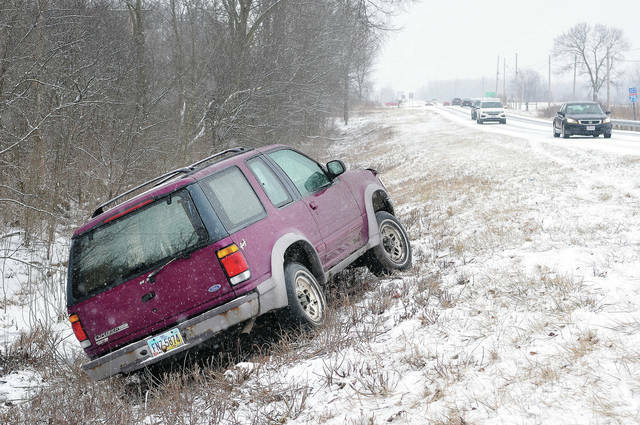 A vehicle sits in a ditch on County Road 25A just north of Interstate 75 around 2:30 p.m. Sunday, Feb. 10. There were a number of crashes and slide-offs as snow fell Sunday. 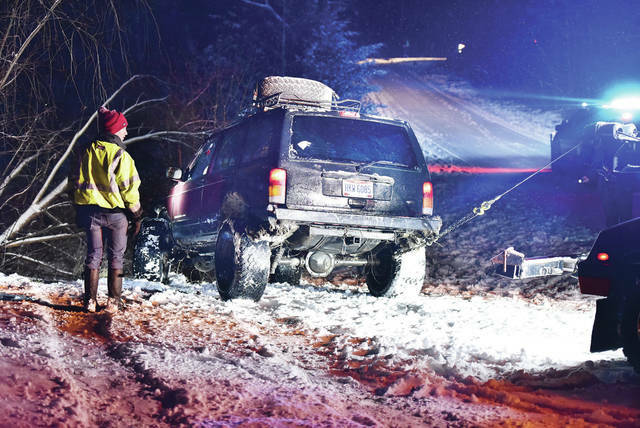 One man sustained minor injuries when his vehicle went into a ravine on Stoker Road around 6:30 p.m. Sunday. Responding were the Lockington Fire Department, Houston Rescue and the Shelby County Sheriff’s Office. SIDNEY — The competition between Mother Nature and Old Man Winter continued Sunday, Feb. 10, as more than 2 inches of snow fell on Shelby County, leading to hazardous road conditions especially on Interstate 75. The snow-covered roads caused of dozens of crashes. Sunday was the worst days for crashes so far this winter, Sidney Police Captain Bill Shoemaker said. He noted although there was an increased number of crashes in Sidney, he said the Ohio State Highway Patrol (OSP) dealt with many more crashes Sunday than Sidney Police. Sgt. David Robison from the Piqua Post confirmed that OSP responded to 21 crashes on I-75 in Shelby and Miami Counties Sunday. There were no serious injuries reported. Robison said there were only a couple of minor injuries out of the 21 crashes they dealt with. “A lot (of crashes) were occurring in the areas of overpasses and bridges because they freeze first since there is no ground under them. There were no serious or life threatening (crashes),” Robison said. I-75 was shut down for a short period of time to get cars removed and wreckers to the scene, he said. Most Shelby and Miami County crashes occurred between 1 to 7 p.m., Robison said, in between mile markers 76 and 94 on I-75, in both directions. A three-vehicle crash was greatest number of vehicles involved in one crash on I-75, he said. “We did call-in the afternoon (shift) early and kept the morning (shift) over. Tried to get as much manpower as possible,” Robison said. Also on Sunday, a trooper’s vehicle from the Wapakoneta Post was hit while Trooper Wesley Ditto, 36, was investigating a single-vehicle crash about six miles north of Wapakoneta on I-75 around 9 p.m. According to a press release from the Wapakoneta OSP Post, Ditto was inside his cruiser, which was momentarily being used to close the left northbound lane, with the overhead emergency lights activated while a wrecker was loading the crashed vehicle he was investigating. During that time, Ditto was scanning his mirrors and noticed a black Honda also in the left lane quickly approach him from the rear. Ditto saw the Honda move to the right lane and suddenly begin to spin out of control. Ditto attempted to move his cruiser, but it was struck in the right rear. The driver of the Honda, Clinton Anderson, 32, Fairfield, was cited for failure to control after the crash. He and passengers, Chattwin Roger, 32, of Cincinnati, and Kirsten Newmwn, 22, of Middletown, were evaluated and released by Cridersville EMS. Seat belts were is use at the time of the crash. No injuries were reported, the release said. Shoemaker said each of Sidney’s officers handled at least a couple of crashes each, but nothing serious. The Shelby County Sheriff’s Office reports deputies, fire and rescue squads responded to 21 reports of crashes or vehicles in a ditch in the county between about 1:30 p.m. on Sunday to 2 a.m. Monday morning. According to the Sidney Wastewater Treatment Plant, there was about 2.5 inches of snow Sunday with a high of 33 and a low of 24 degrees. Sunday was the first snowfall of the month of February. So far this year, Sidney had about 5.1 inches of rain and snow precipitation.